We have prepared a small Christmas gift for all. Starting from today you can enforce the use of secure connection (HTTPS) when working with Kanban Tool. This is an account-level setting and will have effect for all users. So if you store some state secrets, like current location of Santa Claus, you can enable this option to make sure all users are connecting with Kanban Tool in the most secure way possible. All communication is encrypted with 256-bit key length, which is even stronger than the one currently used by Google, and even Santa can't break it to sniff your data. We would like to thank you for using our solutions and wish you a joyful, merry and relaxing Christmas time. We have added some new methods to our API, which will allow you to read recent board activity and interact with Comments and ToDo lists. They are explained on the freshly redesigned API documentation page. Apart from tech changes we have greatly improved dashboard look and feel, which has been re-designed to be more modern, friendly and easy to use. Adding new team members is now also much faster and simpler - you can invite them directly from the sharing page. - and many other small tweaks which will make your work more efficient. We would love to hear what you think about latest changes. Your feedback is really valuable for us and influences the future development of Kanban Tool. We have improved the experience for all iPad users. It's really amazing how intuitive dragging tasks with your finger is! We have also fixed few minor bugs with iPad version of Safari. Another small tweak requested by many users was ability to move the opened card to see what's under it. As usual, if you encounter any problems with the new features or have suggestions how to make Kanban Tool better, please let us know by sending feedback. We are happy to announce another goodie for Google Chrome users - a toolbar button which lets you add tasks to multiple boards without losing the stream of consciousness. It can be installed from here. Also, some people reported problems when importing tasks with external IDs. This issue should be fixed now. We are constantly improving our service to better meet your needs. If you encounter any problems with the new features or have suggestions how to make Kanban Tool better, please let us know by sending feedback. By a common request, we have added an external identifier field for tasks. You can enable it on the "Board Settings" > "Card Template" page. CSV import file format is now being remembered between imports. This should be helpful when doing regular imports from the same source. We have added a new API method, listing users and permissions for given board. As you might have noticed, from some time we also support direct task links. 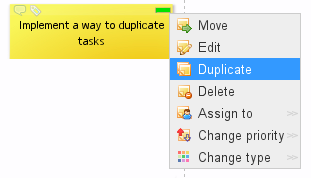 Once you open the task view, you can copy the URL and share it with others. We are constantly improving our tool to better meet your needs. If you encounter any problems with the new features or have suggestions how to make Kanban Tool better, please let us know by sending feedback. Secure connections using SSL protocol are now also fully supported. We are constantly improving our online kanban boards to better meet your needs. If you encounter any problems with the new features or have suggestions how to make Kanban Tool better, please let us know by sending feedback. In next release we plan to focus on improvements to the email notifications and our systems architecture. 1. 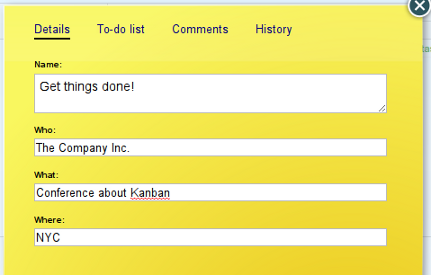 We are happy to announce first public beta of Kanban Tool API! You can use it to push and pull information between Kanban Tool and your own applications, allowing to fully integrate it with your existing systems and workflow. Preliminary API developer documentation is available on kanbantool.com/about/api. The full API will be rolled out in phases, basing on your feedback, with all changes being backward compatible. For a limited time, the API is open to all users, but eventually any write access will be restricted to paid accounts only. Reading data from API will remain open for all account types. We have received a lot of suggestions about adding email notifications support to Kanban Tool. and plan to add notifications for other events in short future. We hope you like the new features. We are constantly improving our online kanban boards to better meet your needs. In next release we plan to focus on the import feature and possibly more notifications. We are excited to announce introduction of paid plans. Money from them will be used to provide even better user experience and to implement new features. They will come back to you with improved efficiency of your work, which we are sure to provide. The plans range from free to enterprise level, and the pricing is really great comparing to other offers on the market. As promised, we are also giving discounts to all existing users who have contributed to making Kanban Tool better. If you are existing customer, please login to your account as administrator to get more details and upgrade instructions. You need to subscribe to one of the offered plans within 30 days. 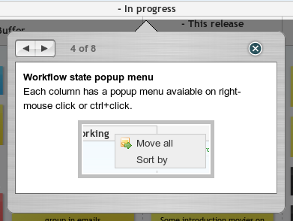 (like Outlook, iCal, KOrganizer, Evolution and many other). Dynamic floating labels which will help you to navigate across large boards. Swimlane name, card type and progress in excel export. New tools menu with export to calendar and subscribe to RSS feed links. We have also finally fixed the issue with accented letters in excel export and made some other small improvements to make Kanban Tool even more friendly, reliable and easy to use. The new, updated look and feel of public pages is live. We hope you like it! As usual, we've also made some other small improvements to make Kanban Tool even more friendly, reliable and easy to use. Another improvement is addition of two card fields - "External link" and "Due date" - which can be enabled on "Settings"-> "Card Template" page. Another bunch of new features is live! collapsed board columns now display card count and limits. Over the past month we have received many inquiries regarding the measurement of cycle time with Kanban Tool. It wasn't easy - you had to use Little's law to deduct it from Cumulative Flow chart. Ever missed the detailed to-do lists / subtasks for tasks? You will find them in the latest update! In the latest update we have focused on two long awaited features. A lot of people wanted to have more card types. Now you can create as many of them as you like! 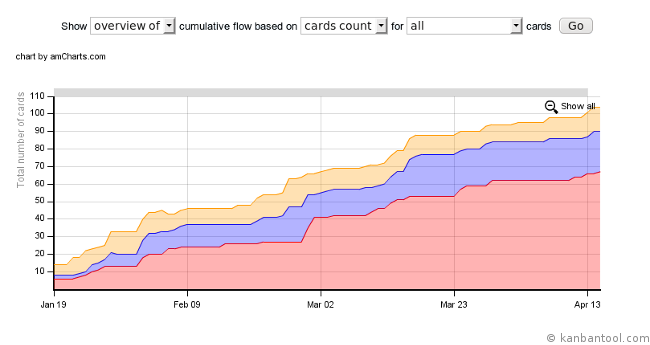 To make this even better, in the next week we will add a bit more card colors to choose from. 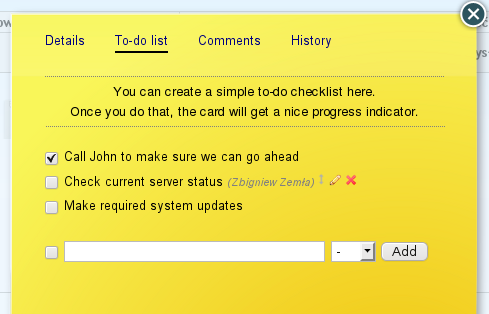 We've also made some other minor improvements to make Kanban Tool even more friendly, reliable and easy to use. If you encounter any problems with the new features or have suggestions how to make Kanban Tool better, please let us know by sending feedback..
We have also fixed some bugs and did minor tweaks to other areas. 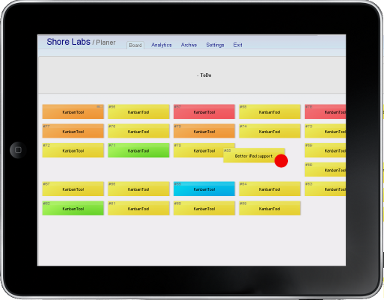 We have received a lot of questions about what are projects for and how to share Kanban Board with other people. Our initial idea was that you should group things by "projects" to which they belong and that you would only want to share "projects" and not the individual Kanban Boards. This had caused a lot of confusion, so we've decided to simplify things a bit. To that end, we've dropped the notion of "projects" and replaced it with "folders". We hope this sounds more clear as the real purpose of projects was to group things up. What's more, you can now share any dashboard item, including Kanban Boards and Notes. 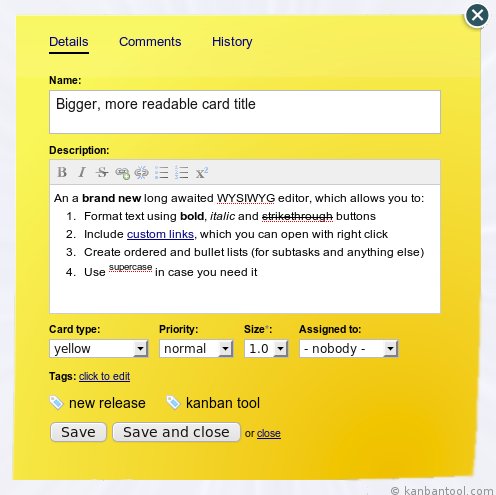 We've also made some other minor improvements to make Kanban Tool even more friendly, reliable and easy to use. If you encounter any problems with the new features or have suggestions how to make Kanban Tool better, please let us know by sending feedback. And a new "size" field on kanban cards, which should help you get the most from kanban board analytics in case your tasks require different level of effort to complete. Account settings - view and modify your account settings (including name). Usage report - get quick insight into some statistics about your account. and probably the most exciting feature: CNAME domain alias support! Now you can access your Kanban Tool account directly from your own domain. We hope you like the new features. 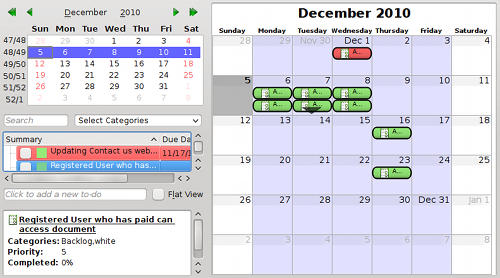 We are constantly improving our free online Kanban tool to better meet your needs. In the next release we plan to focus on extending and improving kanban board analytics. In the latest release made on Thursday we have added several useful features and improvements. You can track all changes with the detailed board changelog. 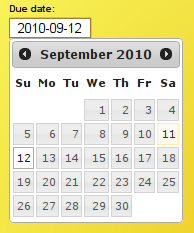 What's more, you can subscribe to it by RSS and also view each individual task history. You can find it in kanban board Analytics. If you like working with Excel / Numbers, you will love the CSV export feature we have added to the archive and changelog pages. 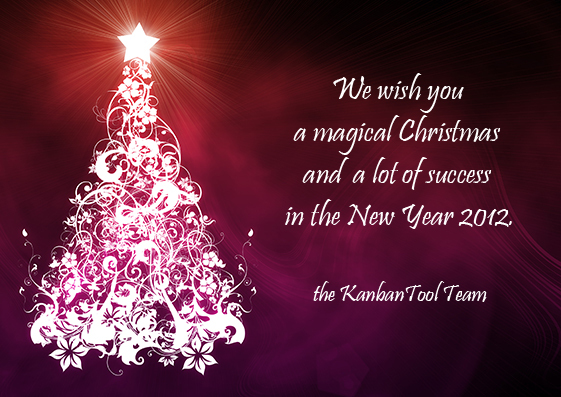 64% of received emails started from positive words about Kanban Tool. Every 2-3 weeks we try to update our online application to meet your needs. 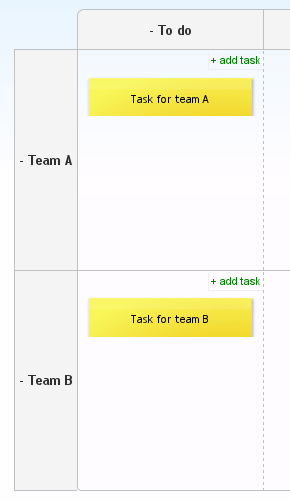 Kanban Tool aims to be the easiest to use online tool for task and project management, both for team and personal use. We are going to use this blog to share with you the latest news, updates and tutorials. You can also find us on twitter and facebook.